Drainwell Plastic Soakwells are polypropylene soakwells which clip together. They can be installed under either trafficable or non-trafficable areas. Does your soakwell need to be replaced ? Do you need a soakwell for your new house ? Novaplas makes Polypropylene Soakwells in Canning Vale. Contact us to buy your plastic DIY soakwells. 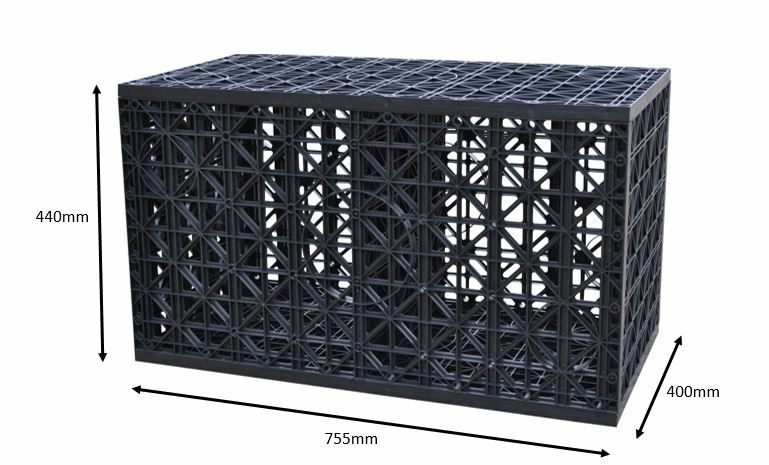 Drainwell soakwells are only 440mm high which makes them an ideal high water table soakage solution. A soak well forms a void just below the surface of the ground. The soakwell is connected by stormwater pipes which are connected to either a series of downpipes or a downpipe from gutters or surface drains. Stormwater pipes discharge stormwater into the void within the soakwell. Water then infiltrates back into the ground. The rate of seepage back into the ground is determined by the open area inside the soakwell. The infiltration rate of a soakwell also depends on the absorption rate of the surrounding earth. Geotechnical engineers can perform soil tests to obtain this information, if required. Drainwell Soakwells have a very effective infiltration surface area. For this reason, the stormwater can soak away into the ground at a faster rate than other types of soak wells. In addition, Drainwell Soakwells are wrapped in geo filter wrap which prevents sand from entering the soak wells. Drainwell Plastic Soakwells are supplied in a flat-pack kit form, hence the term DIY soakwells. Plastic Soakwells consist of panels which are simply clipped together by hand. 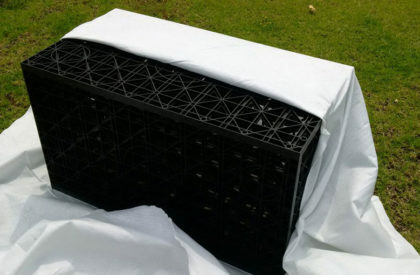 The plastic stormwater crates are light weight. 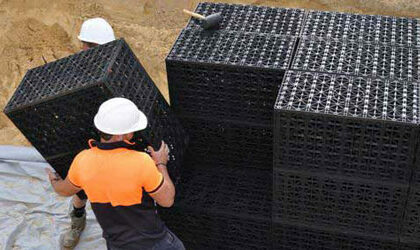 Furthermore, soakaway crates do not require a concrete paving slab or concrete soakwell lid above them. Our quick guide below will show you how to install polypropylene soakwells. Dig a hole to the size required. Level the base of the pit and compact. Backfill the pit with approx 100mm of coarse sand, and compact. 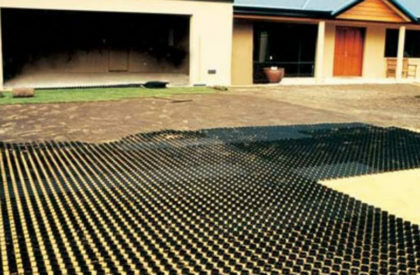 Line the base and walls of the pit with Geotextile, ensuring the seams have a minimum 200mm overlap. Seal the joints with adhesive PVC tape. 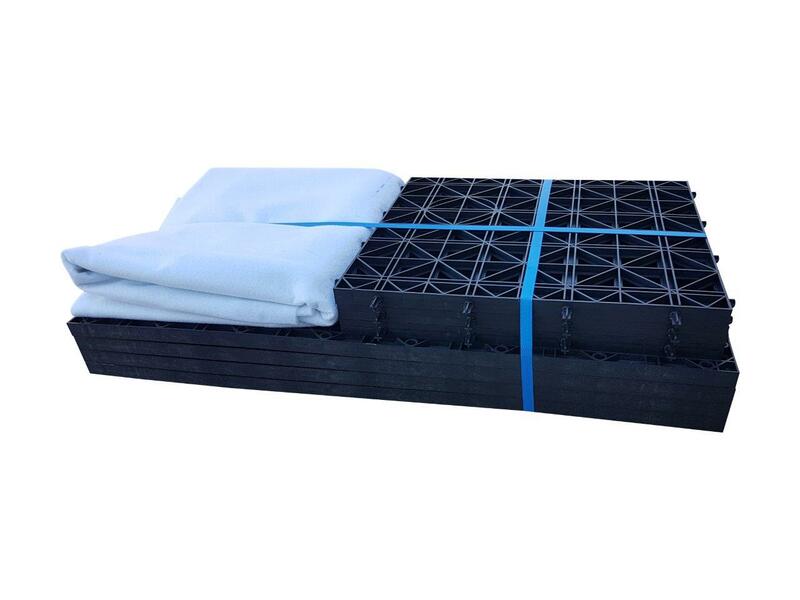 Allow sufficient Geotextile length to cover the surface of the Drainwell modules once positioned in pit. Once assembled, place Drainwell modules into position, on top of the Geotextile, inside the pit. Furthermore, ensure modules are placed with 440mm side in the upright position. If required, secure Drainwell modules together with clips or heavy duty cable ties. Cut holes in the correct position for inlet and outlet pipes. The outlet would usually be positioned lower than inlet. Tightly cover the sides and top of modules with Geotextile. Ensure overlaps and inlet/outlet areas are sealed with adhesive PVC tape. Backfill around the sides and top of the modules with a minimum of 100mm clean coarse sand and compact according to engineers specifications. Finally, backfill a minimum 600mm of clean fill on top of the modules and compact according to engineers specifications. Polypropylene Soakwells usually cost less to install than concrete soakwells. Concrete soakwells are heavy and difficult to install. When polypropylene soakwells have been installed, it is easy to access them again. As a result they are easier to maintain. Drainwell Soakwells can be installed under concrete slabs, as well as under driveways, and under car parking areas. There is a cut out guide which is used to insert a 90mm PVC pipe into the side or the top of the Drainwell Plastic Soakwell. Call Novaplas Group today to find out more about our soakwells for sale. These Clip together Soakwells can withstand vehicle loads. Drainwell Soakwells do not require a Concrete Lid or Blue Metal Stone. Flat Packed, Easy to Handle, furthermore, Easy to Transport. Panels clip together by hand, hence no special tools are required. Made from 100% recycled materials, therefore, environmentally friendly. Australian Made, hence, quality is consistent. Drainwell Underground Stormwater Detention Tanks control stormwater runoff and mitigate flooding. Leach drains are used to dispose of effluent from Septic tanks and have seepage holes in their sides and base.